The Ruby Slippers were made famous by Dorothy Gale, a character portrayed by Judy Garland (1922-1969), in the 1939 film The Wizard of Oz. Based on the 1900 novel The Wonderful Wizard of Oz by L. Frank Baum (1856-1919) and produced by Metro-Goldwyn-Mayer, this fantasy tale set in a magical land is recognized for its extensive use of Technicolor and has endured to become an American classic. The story had previously been adapted into a cartoon, stage musical, and several silent motion pictures. To take advantage of new Technicolor technology, the slippers were changed from the book’s silver to an iridescent red hue. They were created by Gilbert Adrian (1903-1959), MGM Studios’ chief costume designer at the time. In the movie, Dorothy is gifted the slippers from Glinda, the Good Witch of the North, to keep them safe from the Wicked Witch of the West and to help her return home to Kansas. Over the years, they have become one of the most iconic parts of the film and of American culture. Several pairs of Ruby Slippers were made for the movie, a common practice with important costumes and props. These slippers are a mismatched pair, indicated by the use of different base shoes and markings that read “#1 Judy Garland” on the right shoe and “#6 Judy Garland” on the left. The shoes are size 5, although the left shoe is marked "5C" and the right shoe is marked "5BC." The right shoe also has demonstrably more wear and evidence of use. The slippers are made of white pumps that were covered with red fabric, painted red soles, sequins colored a dark red to match, and bows made of stiff cotton and adorned with three kinds of beads and rhinestones. This pair has orange felt adhered to the bottom to muffle Garland’s footsteps as she danced on the yellow brick road. The Ruby Slippers were donated to the museum anonymously in 1979 and were almost continuously on display until April 2017 when they underwent extensive research and conservation by a team of over a dozen experts from the National Museum of American History, the Museum Conservation Institute, and the National Institute of Standards and Technology. The work was funded by a successful 2016 Kickstarter with more than 6,000 backers. The slippers return to view on October 19, 2018, in the museum’s newly renovated third floor West Wing. They are one of the most asked about artifacts at the Smithsonian. 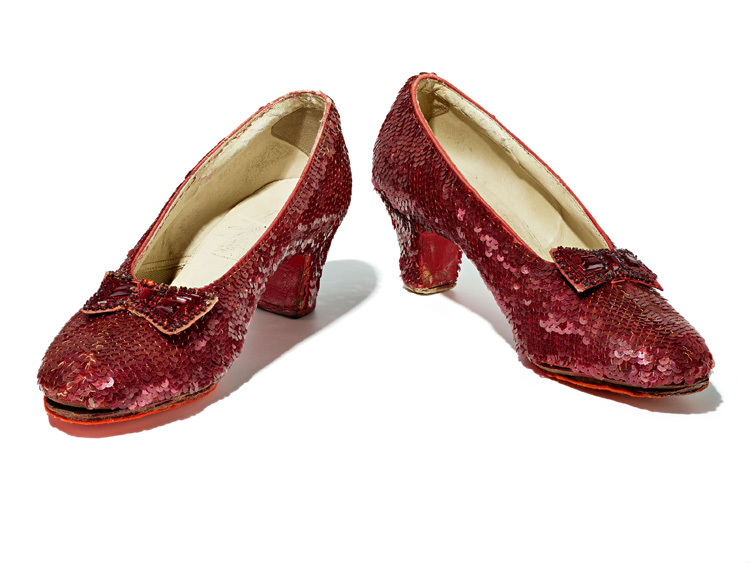 In September 2018, the FBI announced that another pair of Ruby Slippers that had been stolen from the Judy Garland Museum in Minnesota had been recovered. Conservators here at the National Museum of American History examined the recovered pair of shoes. Our conservators confirmed that the recovered pair are consistent with the condition, construction, and material of the Ruby Slippers in the museum's collection. The museum has long known that our pair of slippers didn't match. The heel caps, inner sole grips, and other details are slightly mismatched between our two shoes. But we didn't know where the corresponding shoes could be found. Conservators discovered that the recovered pair and the museum's pair actually create two matching pairs. The next steps for the recovered pair are unknown as of September 2018, but museum staff members are thrilled that the missing shoes have been found. 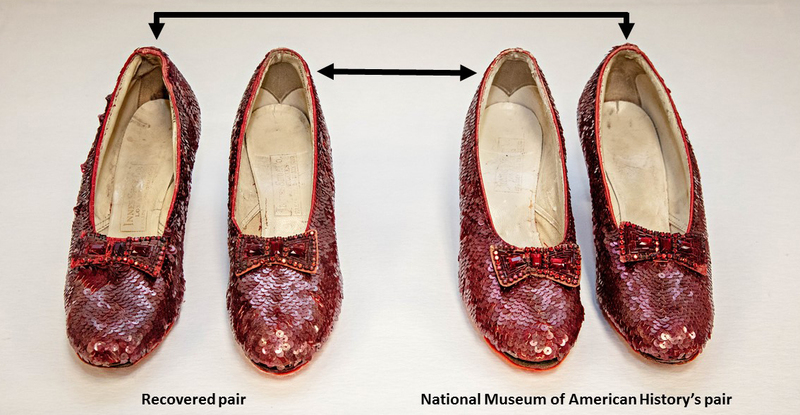 The Ruby Slippers recovered by the FBI and the Ruby Slipper's in the museum's collection are mismatched twins. Bright red is how we remember them, but Dorothy's famous shoes were originally silver. Take a look behind the scenes to see how the Smithsonian keeps the ruby slippers sparkling in the spotlight. Dorothy's Ruby Slippers from "The Wizard of Oz" are nearly 80 years old. How can we keep them on display for 20 more years? This video launched the museum's #KeepThemRuby Kickstarter campaign to support conservation of Dorothy's famous shoes. Sign up for the museum's monthly newsletter to learn more about beloved objects such as Dorothy's Ruby Slippers.